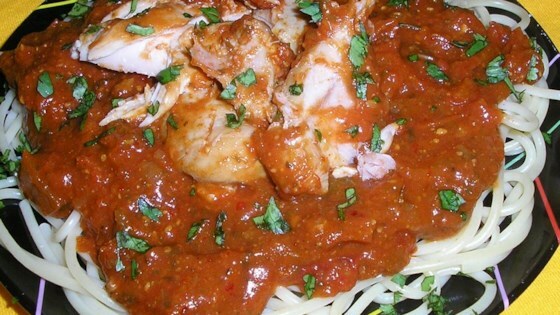 "Chicken breasts with a quick and great sauce over rice." In a large pot over medium-low heat, mix the pasta sauce, picante sauce, tomatoes, tomato paste, and Parmesan cheese. Season with oregano, thyme, parsley, cayenne pepper, salt, and black pepper. Place the chicken in a separate pot with enough water to cover. Bring to a boil, reduce heat to low, and simmer 25 minutes, until chicken juices run clear. Transfer chicken to the pot with the sauce mixture. Cover, and cook on low 1 hour. In a separate pot, bring the rice and water to a boil. Reduce heat to low, cover, and simmer for 20 minutes. Serve the chicken and sauce over the cooked rice. I didn't have the proportions exactly right since my jar sizes were different, but it was still delicious. My kids (2.5 and 5) ate every bit on their plates and my daughter asked for more! It was OK, nothing great or terrible about it. Nice easy recipe. I like that the chicken is boiled in water instead of fried in a pan since I'm watching my fat consumption. This was very good. Spicy and delicious. I served it over pasta.